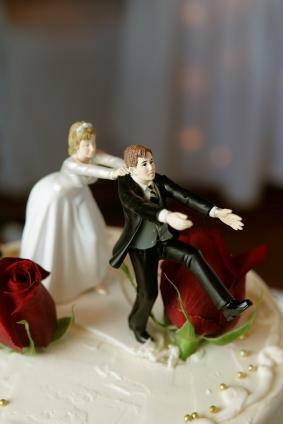 Sometimes it's fun to be nontraditional, and using humorous cake toppers is one way to do that. You can find such a topper for most any occasion, or you can make your own. They work especially well if the occasion you're making a cake for is itself lighthearted in nature. For other funny topper options, keep the couple's hobbies in mind. If they are both football nuts, you can put mini jerseys on the bride and groom, or use mini football helmets as toppers. It's especially funny if they're fans of rival teams. If they love Harleys, put motorcycles on top of cake. If they're tech geeks, you can even get his and hers PCs. Humorous retirement toppers have a couple themes to them-in most cases, golf or relaxation. If the person retiring is neither a golfer nor someone content to spend his or her retirement napping in the sun, you can go nontraditional. Remember that pretty much anything that fits on the top of a cake can be a cake topper. It doesn't have to be officially labeled as such. For example, if the retiree is more of a ping-ping player, use a cluster of the little white balls instead. Just make sure no one actually used them before topping the cake with them. The humorous options for birthday cakes are virtually endless. If you're making a cake for a child, it's best to go with whimsical toppers, like clowns or cartoon characters, instead of ones that are straight out humorous. Because of their young age, they may not be in on the joke. However, if you're making a cake for an adult, you can pull out all the stops, so to speak. Check out the topper collection on Justcaketoppers.com. There you will find professional wrestlers, pirates, a "macho man," a sleeping garden gnome, and many more options. To personalize any human or animal cake topper, cut out a small image of the guest of honor's face and tape or glue it to the face on the topper. A good way to choose humorous cake toppers for a baby shower is to check out the parents' baby registry. In most cases, you'll notice a certain theme to the gifts they want, which gives a key to the theme they want for baby's nursery. If that doesn't give you a good hint, you can turn to the parents' likes and dislike. If this still doesn't help you, just go for cute. For example, consider the sock monkey topper available on Etsy. For New Years parties you can't go wrong with either a clay baby or a couple of plastic champagne bottles. You can also use an old, bearded man who represents Father Time, or a pocket watch. If you want to use Father Time, you may have some trouble finding such a topper. This is no problem though. Just make your own instead, using gum paste figurines. If you have some artistic talent, it should not be too difficult to fashion a topper out of polymer clay or gum paste. If you're not a sculpting wizard, however, you may want to take an image and print it out on edible paper using edible ink. Then you can use this image as a 2-D topper.